The Annual General Meeting of your society. Come along and participate! Nominate for the committee, have your voice heard. Are there particular events you would like your society to organise? A presentation (TBC) will occur after the formal business of the meeting. 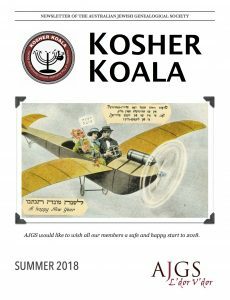 It’s been a while since our last issue of Kosher Koala but it’s finally here… and worth the wait. Society President, Robyn Dryen, gives her ‘State of the Society’ report, outlining the various successes and challenges faced by AJGS last year. Di Edelman outlines a fascinating family story in The WACHMANs – three Lithuanian Jewish families – obviously connected but how? Can you help solve this family mystery? Evelyn Frybort shares her experience of touring China, with a distinctly Jewish flavour; and Dianne Johnstone recounts the moving experience of “hearing the voice” of her 3rd great grandfather, Barnet Lazer, when she had the chance to view original letters written over a century ago. 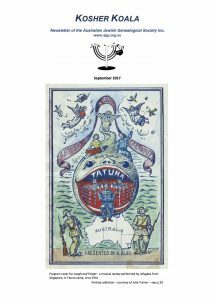 This edition is the final issue under the editorship Robyn Dryen, and is jam packed with fascinating stories, useful information and handy links to help you on your genealogical journey. Just click on the cover image above to read the latest edition. Between 3pm and 4pm there will be an exploration of the many and varied facets of JewishGen, one of the most comprehensive Jewish Genealogical websites. If you have any questions about navigating or getting the most out of this resource here’s your chance to ask them. Before and after this talk you can get help and explore our resources. If you have any particular resources you’d like brought over from Lindfield email us at society@ajgs.org.au. Another Eastern Suburbs workshop will be held at Waverley Library on October 29.